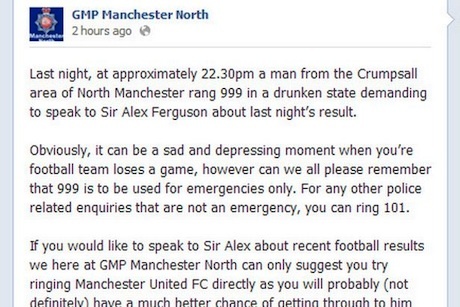 After Paddy Power had a laugh at the Red Devils' expense, a division of the Greater Manchester Police has joined the fun on its Facebook page to underline abuse of 999 calls. The story that a drunken fan had called 999 demanding to speak to former manager Sir Alex Ferguson did not get out because of a press office tip-off or because of a journalistic scoop. Instead it has a lot to do with the Greater Manchester Police having trained 300 officers in the use of social media as part of a "devolved" communications strategy. "We now have about 100 Twitter and Facebook accounts," explains the force’s head of corporate communications Amanda Coleman. So how did the story get out? "We didn’t place it," she says. "It was based on a Facebook entry put out by the GMP North area immediately after the 999 call to highlight the importance of not misusing the 999 number." The entry was then picked up by Manchester Evening News and over the course of 36 hours the story went nationwide, getting greater pick-up than Paddy Power’s earlier "emergency Sir Alex Ferguson" PR stunt. The force has encouraged local police teams to take the initiative in the use of social media and most areas have as many as four people capable of using it on every watch. "They are told to issue very local crime prevention advice and update the community regularly on community policing issues. Having been trained, they know their own areas better than we do so they use their own discretion. "We started in 2010 but it took a year before we got every neighbourhood on Twitter. We took the decision to keep it very local." The force accepts that this lack of central control means that sometimes they might not get it right. According to Coleman it is a risk worth taking. "Ninety-five per cent of what they do is fine. Occasionally they might overstep the mark. But this policy makes a real operational difference. So mistakes are balanced by the gains in policing efficiency and local community relations." The force has distributed a guide to social media to all officers, and it is by no means the only branch of the police getting to grips with the medium. This month the Association of Chief Police Officers (ACPO) updated its guidance on safe use of social media for officers and staff. Social networking sites have offered "significant new opportunities" to make contact or consult with communities, says the report. Neighbourhood officers can access hard-to-reach groups, forces can respond "live-time" to incidents of public concern and rumours and speculation can be countered, it adds. It concludes: "The internet and social media offer significant benefits and services to police officers and staff but they are not without risk. For instance social media makes it easy for officers to accidentally disclose 'operational material or tactics'. "ACPO encourages all members of the police family to take advantage of those benefits but to do so responsibly and in a manner that reduces risks to an acceptable level." Surprise Pac-Man projection on to Sega HQ building aimed to "raise a smile"